Check out this Cool bar gadget.. The Wine Aerator Bottle Chiller & Pourer Gift Set!! 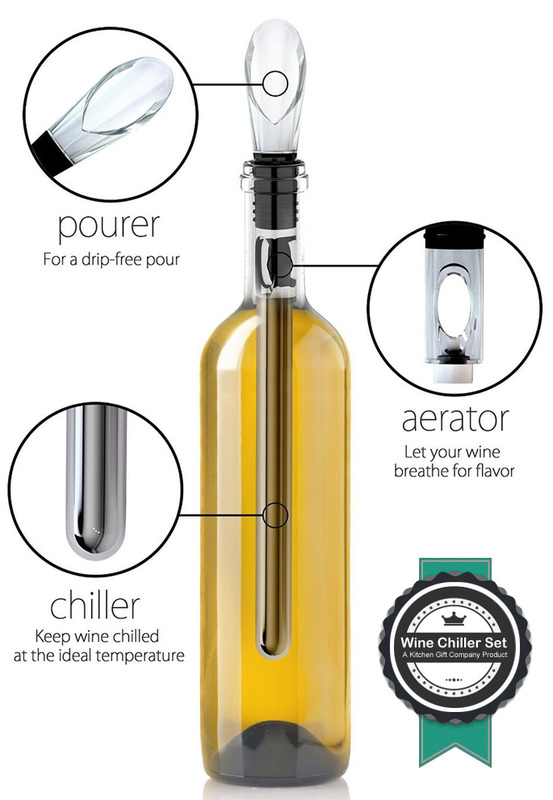 This handy 3 in 1 wine gadget features a detachable gel-filled stainless steel chiller rod which can be stored in the freezer until ready to use. When popped into a bottle of chilled wine it will keep it cool from the inside and the built in aerator oxygenates your wine boosting the aroma and enhancing the flavour whilst the non-drip wine pourer will ensure a clean, easy non drip pour. Can be used as a wine aerator and pourer on it's own for red wine or with the chiller rod for white wine, perfect for dinner parties and alfresco garden parties eliminating the need for large messy ice buckets, plus it makes a great addition to any home bar for all those wine lovers out there. Comes in an attractive presentation gift box....all ready to wrap! !